● Provides policy on unmanned aircraft system operations, unmanned aircraft crewmember training and currency requirements, and flight rules. ● Covers Army unmanned aircraft system general provisions, training, standardization, and management of unmanned aircraft system resources. ● Must be used with AR 95-23. Applicability. This regulation applies to members of the active Army, Army Reserve, and Army National Guard; and DOD civilians and civilian contractors who provide training on or are involved in the operation, standardization, and maintenance of unmanned aircraft systems. During mobilization, the policy in this regulation may be modified by the proponent. a. Prescribes policy and procedures for Army unmanned aircraft system (UAS) aircrew training and standardization, and for operating UASs in USEUCOM areas under CG, USAREUR, control. b. Is not intended to be used in place of AR 95-23. The intent of this regulation is to provide additional guidance for UAS operations in USAREUR. When differences between the policy in this regulation and AR 95-23 exist, the more stringent policy will be followed. c. Applies to all Army UASs, including Hunter, Raven, Shadow, and Warrior. 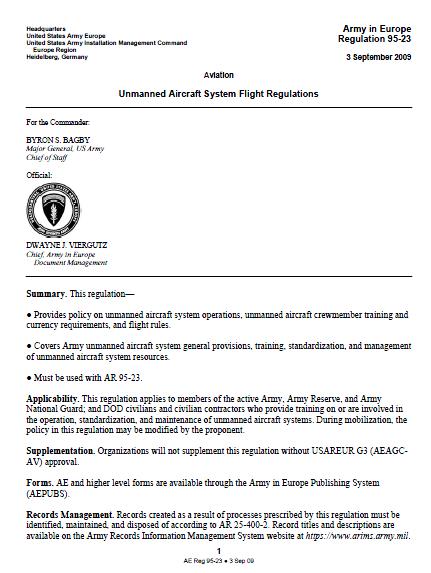 Personnel responsible for other military or nonstandard UASs will adhere to all UAS regulations and coordinate with the USAREUR G3 (AEAGC-AV) before using these systems for flight operations.